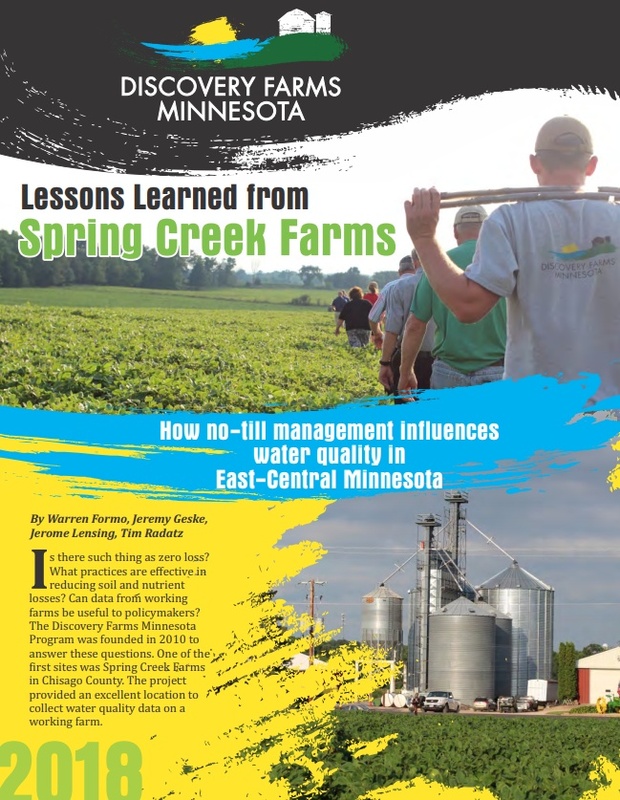 Discovery Farms Minnesota has published a new report titled, Lessons Learned from Spring Creek Farms: How no-till management influences water quality in East-Central Minnesota. Below is a summary of the findings of the project, details of the study and findings can be found in the full report. The report can be found on the resources page at the Discovery Farms Minnesota website. Spring Creek Farms joined the Discovery Farms Minnesota program in the fall of 2010 with the installation of surface runoff monitoring equipment on one of their fields and continued in the program through the fall of 2016. Spring Creek Farms is a grain farm located near North Branch, Minnesota in Chisago County, owned and operated by John and Jewell Peterson. The farm is close to the St. Croix River and the rural/urban interface of the Twin Cities metropolitan area. This location presents unique challenges for production agriculture because of the multiple demands for land use and a heightened interest in the potential effects of agricultural practices on the quality of the surrounding environment. Six years of on-farm, edge-of-field surface runoff data was collected at Spring Creek Farms from a 6.1 acre field. The field had loam soils and an average slope of 3.4%. The site selected for monitoring provides an edge-of-field evaluation of a corn-soybean rotation and no-till management system. 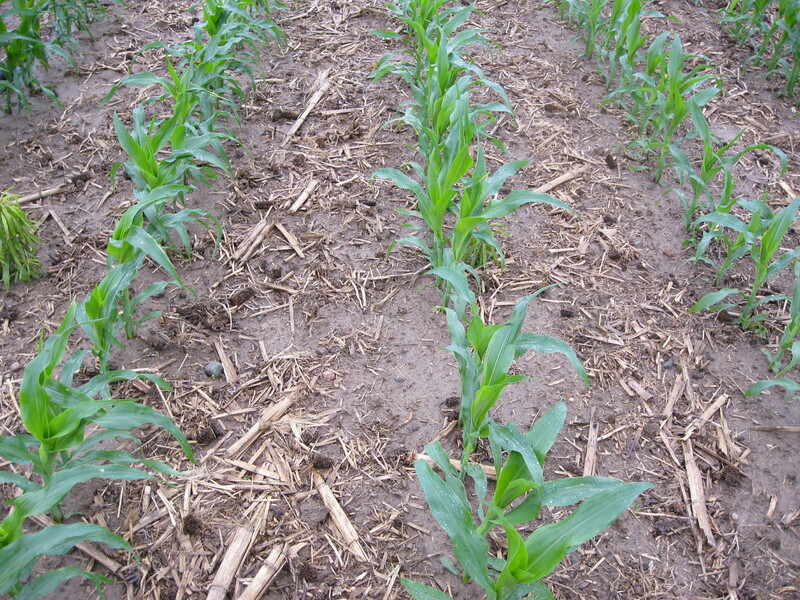 No-till planting is implemented for both the corn and soybean crops. No-till planting has been used since the mid-1990’s by Spring Creek Farms. Phosphorus and potassium have been surface broadcast prior to the corn crop to meet the nutrient needs since moving to no-till practices. Starting in 2010, Spring Creek Farms modified their phosphorus and potassium application method. Their current application method places the phosphorus and potassium fertilizer in bands directly beneath the row. Corn is planted directly over the band and depth is adjusted so that there is 1.5 inches of soil between the fertilizer and seed. Soybeans utilize residual fertilizer the following year. The nitrogen management program consists of two side-dress applications for the corn crop. Water quality risks are minimized with appropriate use of conservation practices and careful timing of nutrient applications. The no-till planting system was effective at producing high yielding crops and reducing water quality risks. Surface runoff was similar to other Discovery Farms Minnesota sites and annual precipitation amounts did not relate to surface runoff. Low soil loss was observed throughout the study due to the high residue levels and no-till planting system. Dissolved phosphorus losses were higher because of stratified soil phosphorus. Spring Creek Farms is taking steps to reduce stratification by banding phosphorus fertilizer below the seed. Timing matters for fertilizer applications. Avoiding application during high risk runoff periods reduces losses. Agricultural management and water quality complemented (and still complement) each other at Spring Creek Farms because of the thoughtful uses of conservation and nutrient management practices. 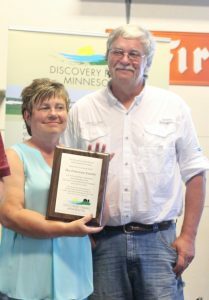 The Discovery Farms Minnesota Program thanks Spring Creek Farms and the Peterson family for their willingness to participate in the project and for their continued engagement and friendship. Thanks also to the Minnesota Department of Agriculture (MDA) and the Chisago County Soil and Water Conservation District (SWCD). MDA provided the monitoring equipment and analyzed the data collected at Spring Creek Farms. Chisago County SWCD helped set up the study, collected the water samples and provided maintenance of the monitoring site.